At Cliftonville we are very proud of our fundraising activities. Friday 16th November is the national Children in Need day where year after year we raise around £1000. An amazing effort. 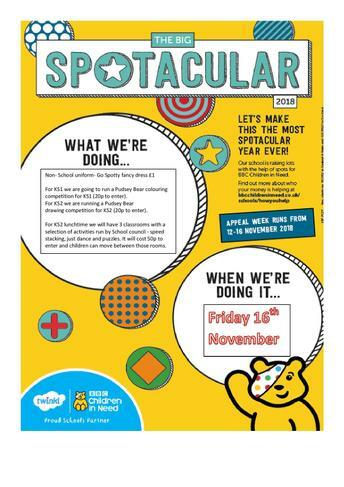 For KS1 we are going to run a Pudsey Bear colouring competition for KS1 (20p to enter). For KS2 we are running a Pudsey Bear drawing competition for KS2 (20p to enter). For KS2 lunchtime we will have 3 classrooms with a selection of activities run by School council - speed stacking, just dance and puzzles. It will cost 50p to enter and children can move between those rooms.